SNL: Now With Triple the Ladies! Two new female castmembers are joining the show to fill Tina Fey and Amy Poehler's (big, big) shoes -- will the estro-boost let it ride its current ratings wave? 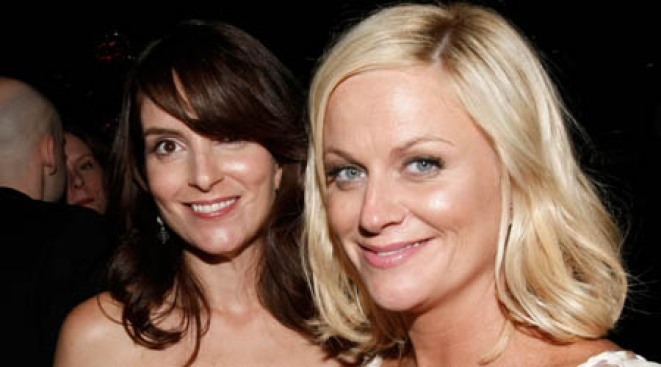 SNL adds two new female castmembers to fill the void left by Tina Fey and Amy Poehler. So basically, Saturday Night Live can pin its current boost in ratings on two things: The election and the genius of Tina Fey-as-Sarah Palin (which, now that we're typing it, kinds of feels like it happened six years ago, doesn't it? ), and the Weekend Update segments with Amy Poehler and Seth Myers (because we'd watch those two do pretty much anything together: frost cupcakes, file down their corns, you name it). Numbers one and two are moot now that the election's over, Fey's back at her day job on 30 Rock, and Poehler's jumped ship to breastfeed the funniest newborn on earth. So how do you surf a crested wave when all your witty women are gone? (Not you, Kristen Wiig -- we adore you and your tiny hands.) You pile a whole bunch of new women on there! Well, two that we know of, anyway: One is Abby Elliott, who according to Gawker is one of the youngest castmembers ever at 21 (and daughter of Chris Elliott, who is, to be fair, only sporadically funny - let's hope the humor gene isn't recessive), and the other is one Michaela Watkins, a Groundlings alum whose audition tape Gawker has online for the judging. In it, she does an impression of Arianna Huffington that we'd happily watch again.